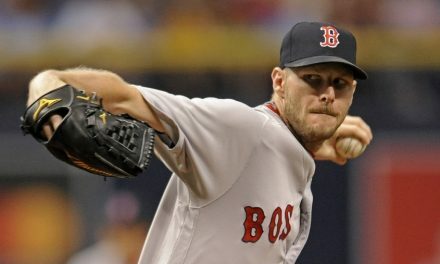 “Random Red Sox of the Day” is a new series of articles I will be periodically writing. This one is the first installment in the series. Random doesn’t mean they weren’t good, just that they aren’t names you will hear come up often in this day and age. Tim Naehring, for instance, was a good player for the Red Sox who seemingly adding to his game every season until an elbow injury ended his career prematurely. Read about him more below. 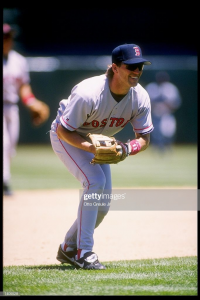 Tim Naehring was drafted by the Red Sox in 1988 out of Miami of Ohio as a shortstop. The Red Sox had also selected a shortstop in the 5th round named John Valentin. Naehring jumped ahead of Valentin in development as Valentin battled an injury shortly after being drafted. By 1989, Naehring had made the leap to AAA Pawtucket, passing over AA during his midseason callup. Naehring held his own and found himself back in Pawtucket for the 1990 season. After swatting 15 home runs, he got the call to the big leagues in July. By his third Major League start, Naehring had hit his first career home run. Two weeks later he had his first three-hit game, which he followed up with another three-hit game which included a home run and four runs batted in. He added a four-hit game a few days later before an injury ended his season, something he dealt with often in his early playing days. Naehring would miss almost the entire 1991 season. He would spend most of the 1992 season on the big league team, serving as a utility player for the Red Sox. Naehring didn’t hit much, but played shortstop, second base and third base. He did win a game with a two-run homer in the top of the 19th in Cleveland in April of that season. Tim Naehring during his early playing days. Tim Naehring was back in AAA for much of 1993, but was showing improvement. He batted .307 with an .873 OPS over 55 games at Pawtucket. After a bit of a sluggish start following his callup, Naehring found regular at-bats in September with the team out of the postseason race and picked up where he left off in Pawtucket. From September 10th through the end of the season, Naehring batted .420 with a 1.047 OPS. He had six hits during a doubleheader on the 10th and wound up with five straight multi-hit games. Naehring was up for good in 1994 and continued showing the promise from his 1993 season. He played his usual infield positions, but was mostly at second base with Scott Fletcher struggling at the plate. Forming a timeshare with Fletcher while filling in periodically around the infield, Naehring batted .276 with 7 home runs over 297 at-bats. He enjoyed his first multi-homer game on April 19th against Oakland, a game in which he went 4-4 at the dish. Boston Red Sox third baseman Tim Naehring stands at the plate during game against the Oakland Athletics. 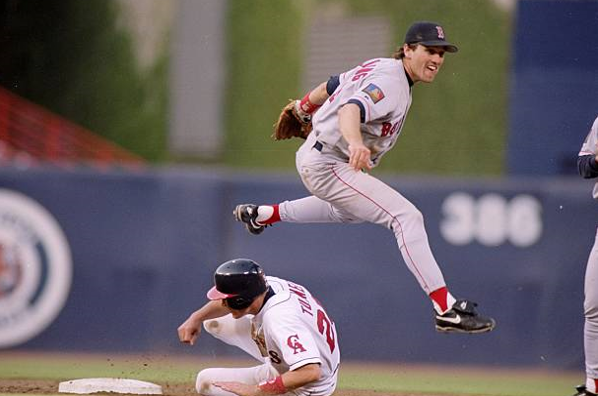 Before the 1995 season, the Red Sox traded away two-time All-Star Scott Cooper. With the move, Tim Naehring would be taking over as their full-time third baseman. Naehring would not let the opportunity go to waste. 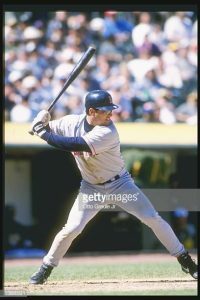 Naehring was leading the American League in hitting as late as June of 1995. He was still batting over .320 into early September of that season before fading a bit down the stretch. Still, Naehring batted .307 with a career high .863 OPS. 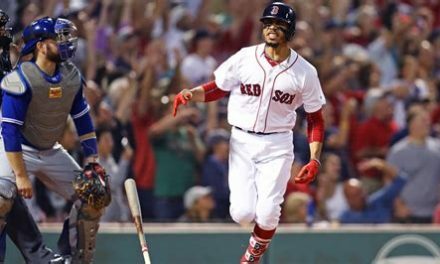 He got on base at a .415 clip, leading the Red Sox and finishing eighth in the American League MVP race. 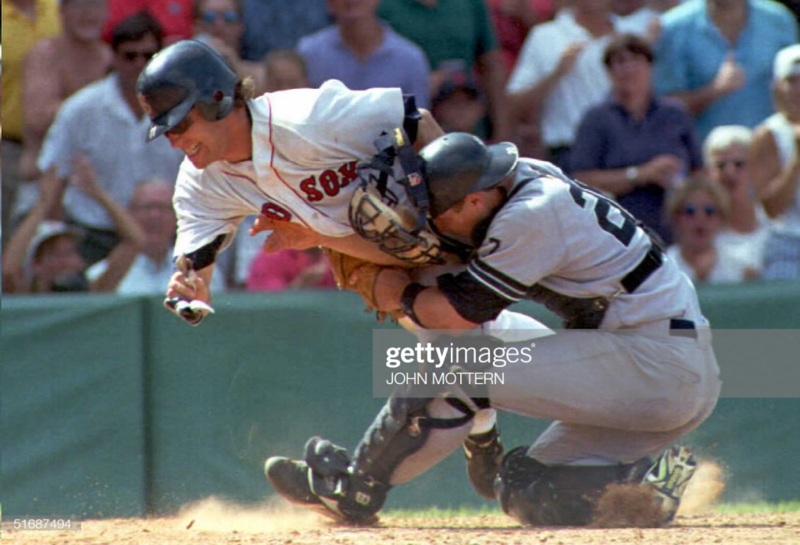 When the Sox bats went cold in the postseason series with the Indians, Naehring picked up four hits and homered. Naehring would set career highs in a couple more categories in 1996. He had an 18 game hitting streak early in the season. In June, he hit his first career walk-off home run against the Indians. With the game tied in the 15th inning, Naehring hit a 2-run homer off future Red Sox reliever Alan Embree. He would go on to hit 17 home runs that season, a personal best. His 65 runs batted in and 77 runs scored were also career highs. 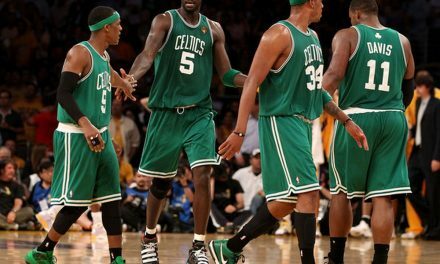 Those highs may not have held up if it weren’t for injury. Tim Naehring was always giving it his all out on the field. 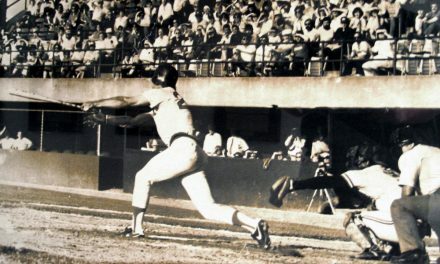 Here he is colliding with Yankees catcher Mike Stanley on a play at the plate. Tim Naehring may have surpassed some of those career highs in 1997 if not for an elbow injury that ended his season, and ultimately, his career. Injured in late June, Naehring had 9 home runs and 40 RBI, and the team had yet to reach the mid-point of the season. He was batting .286 on 74 base hits with an .843 OPS. He likely would have surpassed his personal bests for both hits and RBI, and might have reached 20 home runs for the first time. On June 23rd, in a win up in Toronto, Tim Naehring collected three base hits and homered. It would be the final game of his career. Naehring blew out his elbow, and with modern medicine probably would have made it back late the next season. As it was, Naehring held out hopes of making a comeback through 1998, but ultimately had to call it quits. He was 30 years old when he played his final game. Naehring faced many injuries during his playing days, but some of that likely stemmed from his style of play. He was always diving for ground balls and going all out in the field. He was a good fielder and a good hitter. Naehring had only committed three errors on the 1997 season when he got hurt. At the plate, he seemingly kept improving as well, batting .295/.387/.451/.837 over his final three seasons. Tim Naehring was always sporting a pair of very stylish shades.